Product #60785 | SKU 996367005 | 0.0 (no ratings yet) Thanks for your rating! 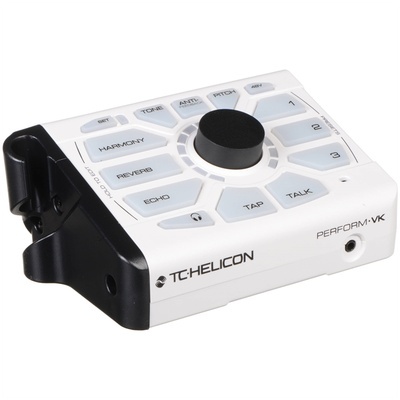 The Perform-VK Vocal Processor by TC-Helicon is designed specifically for keyboard players and creates vocal harmonies based on the pitch of your voice, with real-time pitch correction. It can detect the key either through its RoomSense mic, an auxiliary input, or via MIDI from your controller keyboard or sequencer. The Perform-VK has seven editable effects, a microphone preamp with phantom power, a one-snap connection to your microphone stand, and large buttons which make it easy to sing and call up effects during live performances. Its Anti-Feedback function is designed to react to room properties and decrease levels of problematic frequencies. The USB interface offers 4-In/8-Out recording capabilities, allowing you to capture dry and wet versions of your vocals, along with harmony voices, and your keyboard's audio. Parameters can be controlled using the Central Encoder Knob, remote functions from your Smartphone, the TC-Helicon MP-75 and MP-76 microphones, and/or footswitches (all available separately). After specifying the volume and style of onboard effects, you can store them in one of the three preset banks. The Perform-VK has editable remote presets accessed through the Preset app, which has up to seven effects with four additional modifiers: Harmony Level, HardTune Gender, AEQ Filter, and µMod Level. These presets can be imported into the Perform-V and edited on the fly via the HIT function. The echo effect can be synched to the timing of the music through the tap-tempo control. The Perform-VK ships with a power adapter and USB cable.